With Jos Buttler making his mark down in New Zealand the thought suddenly crossed my mind that we have as much quality in the wicket keeping department, as there are bottles of nandrolone in your average Australian dressing room! Often the best wicket keepers when it comes down to pure glovework do not make the side any more as you have to be able to bat but it seems we have plenty who are decent at both. Here we have a look at those past, present and future who are the stars with the gloves in England at present. Chat Taylor...the best glovemen don't necessarily make the side any more! Matt Prior is the man with the job in our Test team at present and with possession being nine tenths of the law, the Sussex stumper is the number one in the UK and rightly so. How he is not playing T20 or ODI for England, I do not know? Our view is that he is up there with the best in the world, and keepers have to be able to bat these days. The days of the likes of Bob Taylor, bless him, coming in at number ten for England are long gone, and Prior often chips in with vital runs in the middle order. I blame Adam Gilchrist for this change personally, although to be fair he was class and so very different. I say different, as he was the first Australian I have ever encountered who 'walked' and not just when his car ran out of petrol! Pushing Prior all the way is Craig Kieswetter and with Buttler being a man who can take the gloves too, Somerset have more depth than the recent flooding in that part of the country. The Cidermen and England are very lucky in this respect. Jonny Bairstow is another who is able with both bat and gloves and another who has made his mark on the English middle order recently. We've interviewed numerous glovemen (although Liam claims he is one, as he is our resident gynaecologist here at The Middle Stump), and generally they have good banter. Paul Nixon was our first interviewee on this site and the Cumbrian spent nearly as much time in his adopted county of Leicestershire as Richard the Third! We often ask them who were the best just with the gloves, and two names crop up time and time again...James Foster and Chris Read. How these two have not played more for their country is a testament to how strong our game is in this department, and has been for a number of years. Read has improved his batting no end, and his work standing up is pure class. Foster meanwhile, will stand up to bowling of any pace and we all know this is the mark of a good keeper. Anyone can stand back but it is their technical work whilst up to the stumps, that sorts the men from the boys. Foster, like the afore mentioned Richard the Third has a couple of youngsters looking to take his crown, although the chances of them ending up in the Tower are slimmer than the wife of Paris St Germain's latest high profile signing! Adam Wheater has lots of potential whilst the nineteen year old Ben Foakes has just been picked for the England Lions. Up the Thames at Lord's, John Simpson is one of the leading keepers in the country and a recent Middle Stump interviewee. Coached by Jack Russell, he can bat and is another who would play for almost any other country in the world at international level if he was not English. He replaced the brilliant David Nash, another of our interviewees and Ben Scott who had to go to Worcester for his trade. Mark Wallace is another reliable man at Glamorgan although mentioning the words Wallace and Simpson together in the same paragraph is almost enough to make a king abdicate! Ben Brown at Sussex is well rated by numerous judges as an up and coming star, while Michael Bates at Hampshire is another fine exponent of the art. He also scored his first ton last year. Richard Johnson is another at Warwickshire who was at Derby last year, whilst Tom Poynton is also very well thought of in that part of the world. Throw in experienced campaigners such Gareth Cross at Lancashire, Phil Mustard at Durham and the likes of Steve Davies at Surrey and English cricket has depths akin to Gazza's fridge! Unfortunately you can only play one wicket keeper per team, and we have riches in this country that makes the rest of the world look on with envy. I'd pick any of the above over Matthew Wade for example, and I thought as well as Dhoni can bat, his keeping was shambolic on England's recent tour to India. Sangakkara and De Villiers are both decent however, but no country has the depth of talent that we possess. 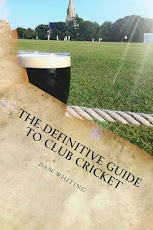 Being a similar vintage to me Dan you will remember the now long lost phrase "specialist wicket keeper". Bob Taylor was the first England keeper I remember watching who really could not bat. The same accusation was once thrown at the old Braughing keeper Stuart "the eagle" eagleton by the Welwyn Garden City keeper when we played em in 1996. Even the early 80s batting keepers such as Aland nurdling Knott and Boshing Blue Bairstow and Rod Marsh added value. In my opinion Foster and particularly Reed were harshly treated by Duncan Fletcher who always wanted to pick Geraint "coaches mate" Jones. Maybe he bought him a chinese at the close of play? Firstly let me leap to the defence of my Kent compatriot a man whose dismissals per innings is greater than that of Knott, Russell and Stewart. In my mind Chris Read had his chances and he never took them. Fletcher and co were right that he didn't have the right on field attitude to thrive and steer that bowling attack. Foster was hugely unlucky, he came in as a replacement for Alec Stewart for the tour of India and kept immensely and showed promise with the bat. The summer was all set for Stewart to return but only as a batsmen with Foster keeping the gloves. His career then hit the buffers as he broke his arm and missed most of the season and his chance with England. Should have said Nixon should have won 100 caps bud.